Today we have another Talking Dogs guest post from the dog daddy at For Love of a Dog, known to some of you as the Chief Medical Examiner and my husband, Gary. 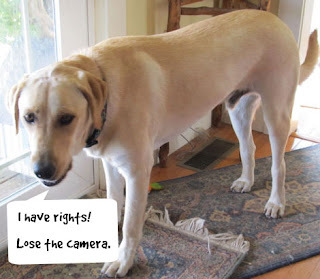 Does your dog have rights? Mine do! Recently I've read a number of articles about animal rights. They've really gotten me thinking about the issue. Of course, as I read and ponder, I have my own three dogs in mind. At first I thought, well, that is that. Of course animals can’t have rights, they have no responsibility. But the more I've thought about it, the more I'm seeing the issue in broader terms. I'll use my dogs to illustrate my recent thinking. I have the responsibility to provide my dog healthy food and water. I have the responsibility to provide my dog with adequate shelter. I have the responsibility to provide a life free of unnecessary pain or violence. I have the responsibility to provide love, attention and companionship. I have the responsibility to provide the training my dog needs to exist in his environment. In our house, as in many, we go well above the basics when it comes to our dogs. They live in our house and sleep in the bedroom with us. Jeffie even has his own pillow on the bed. They enjoy organic dog food and a fenced two acre back yard. I could go on, but won't. Any real dog lover knows the drill. Now back to my dogs. I believe they have a right to all the things that I am responsible for giving them. So if they have these rights, what are their responsibilities? Well, they are responsible to do many things and to not do many things. My dogs are responsible to return the love, attention and companionship that I show them. I pat their head, they lick my face. Basic give and take. They are responsible to eat the food I provide, accept the shelter I offer, to come when I call them, to guard our home, and accept any training demands I place on them. Of course, anyone who loves a dog knows they do much more than the basics without expecting anything in return. Now for the list of what they are responsible to not do. My dogs are responsible to not do their business in the house; not to beg when told not to; not to bite me, visitors or the vet; not to bark at night or keep me awake; not to chew the furniture or rugs. This list could go on, except my dogs are so good I can’t think of any more. So there you have it. My dogs have rights and they have responsibilities just like I do. My guess is that your dogs have rights, too. What a terrific post! I love it! Yes, they too have rights and responsibilities.